Not your boyfriend, not human either. Living together with sprites that suddenly materialize? Just like freebies that come together with bottled drinks like phone straps and magnets, some products come together with healing sprites. They are known as Therapia. Appearing as you open a capsule that comes together with the goods, they will soothe you when you use products connected with them. The sprites will fulfill you, whether while they're soothing you or making your heart go pitter-patter, as you live together with them. Soaked from the rain, you reach home irritated. You come out of the shower. Therapia: Ah master, you're warmed up? I've wiped your shoes. I don't think they'll get out of shape. Once dry, they'll be as good as before. It doesn't look like the things you bought got wet either. ... That bath towel? Heehee, yesterday it was washed with fabric softener and dried with a good dose of sunshine. It feels good and fluffy, right? ... Does it smell good? Therapia: ... Heehee, you look less annoyed now. You reply that you're not annoyed. Therapia: (teasing voice) Eh, you sure were~ Your brows were all wrinkled up, all mashed up. You get a little angry and smack the towel. Therapia: Haha, sorry. The master's usual cute face has returned so it's all right. (Gentle voice) Is it soothing, the fragrance of the fabric softener? ... Can I heal you even more? Therapia wraps himself around you. Therapia: Don't do that. Stay still. ...Yes, like that. Close your eyes, take a deep breath. 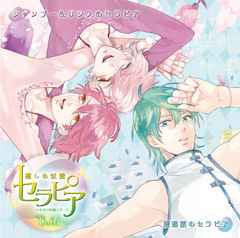 Drama CD Ikinari Dousei Series Iyashi no Yousei Therapia Vol.2 will go on sale 20th June 2012, priced at 2625 yen. 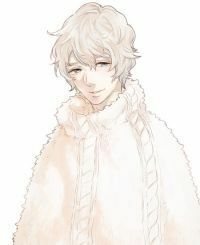 It will also feature a Dressing Therapia voiced by Yoshino Hiroyuki. Volume 1 went on sale 22nd February 2012 and featured a Cold Medicine Therapia (Yusa Kouji), Shampoo Therapia (Okamoto Nobuhiko) and Conditioner Therapia (Kimura Ryouhei).